Your family is precious! That is such a sweet picture of you guys. You better put your running shoes on b/c there's no stopping him now! they really are growing soooo fast! Wow! So cute Taber! I hope you frame that last picture-it is adorable! You all look great! 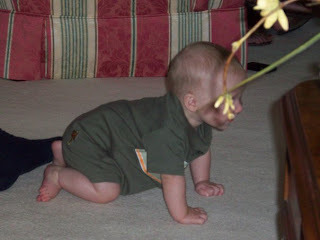 I can't believe he's crawling already!! ya'll are precious! What a cute family pic!!! 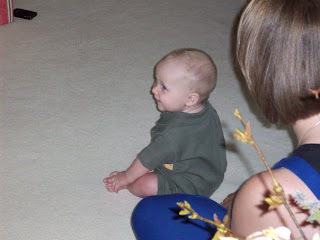 I can't believe Jett is old enough to sit & crawl...wow, time is flying! 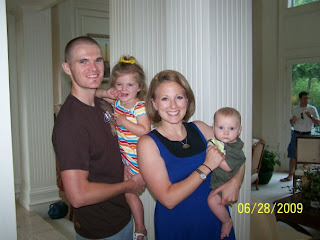 PRECIOUS FAMILY!!! I can't believe how BIG Jett is! Put a brick on his head please. ;) Your hair is super cute too! !